2008-06-09 Assigned to ABBOTT CARDIOVASCULAR SYSTEMS INC. reassignment ABBOTT CARDIOVASCULAR SYSTEMS INC. ASSIGNMENT OF ASSIGNORS INTEREST (SEE DOCUMENT FOR DETAILS). Assignors: DING, NI, PACETTI, STEPHEN D.
A polymer of siloxanes as flexibility monomers and strength monomers is provided. It is also provided a polymer blend that contains a polymer formed of siloxane monomers and strength monomers and another biocompatible polymer. The biocompatible polymer or polymer blend described herein and optionally a bioactive agent can form a coating on an implantable device such as a drug-delivery stent. The implantable device can be used for treating or preventing a disorder such as atherosclerosis, thrombosis, restenosis, hemorrhage, vascular dissection or perforation, vascular aneurysm, vulnerable plaque, chronic total occlusion, claudication, anastomotic proliferation for vein and artificial grafts, bile duct obstruction, ureter obstruction, tumor obstruction, or combinations thereof. This is a continuation application of U.S. application Ser. No. 10/909,795, filed Jul. 30, 2004, the teaching of which is incorporated herein in its entirety by reference. This invention generally relates to a polymeric material useful for medical application such as for coating an implantable device, one example of which is a stent. Although stents work well mechanically, the chronic issues of restenosis and, to a lesser extent, stent thrombosis remain. Pharmacological therapy in the form of a drug-delivery stent appears a feasible means to tackle these biologically derived issues. Polymeric coatings placed onto the stent serve to act both as the drug reservoir, and to control the release of the drug. One of the commercially available polymer coated products is stents manufactured by Boston Scientific. For example, U.S. Pat. Nos. 5,869,127; 6,099,563; 6,179,817; and 6,197,051, assigned to Boston Scientific Corporation, describe various compositions for coating medical devices. These compositions provide to stents described therein an enhanced biocompatibility and may optionally include a bioactive agent. U.S. Pat. No. 6,231,590 to Scimed Life Systems, Inc., describes a coating composition which includes a bioactive agent, a collagenous material, or a collagenous coating optionally containing or coated with other bioactive agents. The nature of the coating polymers plays an important role in defining the surface properties of a coating. For example, an amorphous coating material having a very low glass transition temperature (Tg) induces unacceptable rheological behavior upon mechanical perturbation such as crimping, balloon expansion, etc. On the other hand, a high Tg, or highly crystalline coating material introduces brittle fracture in the high strain areas of the stent pattern. Some of the currently used polymeric materials have some undesirable properties such as lack of sufficient elongation to use on a stent or low permeability to drugs. One such polymer is such as poly(vinylidene fluoride) (PVDF). Therefore, there is a need for new polymeric materials suitable for use as coating materials on implantable devices. The present invention addresses such problems by providing a polymeric material for coating implantable devices. Provided herein is a polymer containing siloxane monomers and monomers that provide strength to the polymer. 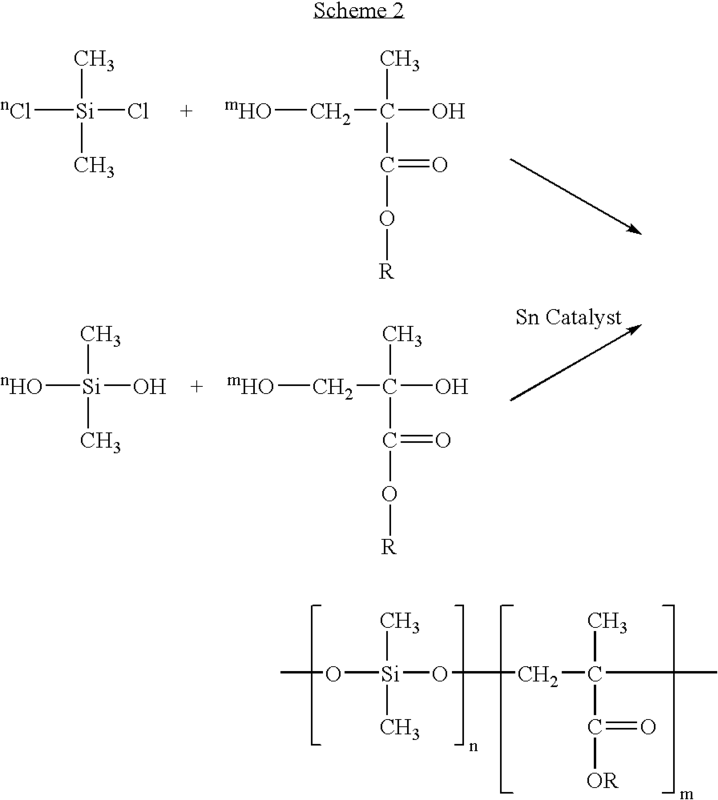 The siloxane monomers can provide flexibility for the polymer. The strength monomers impart strength to the polymer. The polymer can be a random polymer. Alternatively, the polymer can be a block copolymer having a general formula of AB, ABA, or BAB, or a graft copolymer such as A-g-B or B-g-A, A being the polysiloxane block and B being the block formed of the strength monomers. The polymer is useful for coating an implantable device such as a stent. where A is an absence, a biobeneficial moiety or optionally a bioactive agent. The bioactive agent A can physically or chemically attached to the polymer. The bioactive agent A can be stable or capable of being cleaved off under physiological conditions. where R1 and R2 are independently H, halo groups such as F, Cl, Br and I, C1-C10 alkyl, C3-C10 cycloalkyl, substituted C1-C10 alkyl, haloalkyl such as fluoroalkyl, chloroalkyl, bromoalkyl, iodoalkyl, phenyl, substituted phenyl such as alkoxyphenyl, halophenyl and alkylphenyl, aryl, or substituted aryl such as alkoxyaryl, haloaryl and alkylaryl, and Z1 and Z2 are independently absence or oxygen (O). The strength monomers can be any biocompatible monomers capable of imparting strength to the polymer. Some representative monomers include fluorinated monomers such as ethylene, propylene, vinylidene fluoride, hexafluoropropene, tetrafluoroethylene, chlorotrifluoroethylene, vinyl fluoride, and hydropentafluoropropene, high Tg methacrylates such as methyl methacrylate, ethyl methacrylate, n-propyl methacrylate, and t-butyl methacrylate, styrene, methyl styrene, hydroxylethyl acrylate, 4-methoxyphenyl acrylate, t-butyl acrylate, o-tolyl acrylate, hydroxylethyl methacrylate, isotactic cyclohexyl methacrylate, cyclohexyl methacrylate, cyclohexyl acrylate, isopropyl methacrylate, 3,3-dimethylbutyl methacrylate, ethyl fluoromethacrylate and combinations thereof. In some embodiments, it is provided a polymer blend that includes a polymer that has siloxane monomers and at least one other biocompatible polymer. 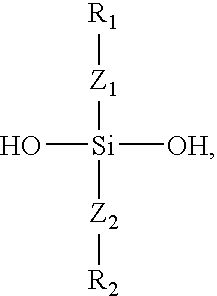 In one embodiment, the polymer that has siloxane monomers has a structure of formula I as defined above. In another embodiment, the blend can be made of a homopolymer of siloxane monomers defined above and homo or copolymer of strength monomers defined above. The polymer or polymer blends described herein can be used to form a coating(s) on an implantable device. The implantable device can optionally include a bioactive agent or a biobeneficial compound that is blended therein. Some exemplary bioactive agents are paclitaxel, docetaxel, estradiol, nitric oxide donors, super oxide dismutases, super oxide dismutases mimics, 4-amino-2,2,6,6-tetramethylpiperidine-1-oxyl (4-amino-TEMPO), tacrolimus, dexamethasone, rapamycin, rapamycin derivatives, 40-O-(2-hydroxy)ethyl-rapamycin (everolimus), 40-O-(3-hydroxy)propyl-rapamycin, 40-O-[2-(2-hydroxy)ethoxy]ethyl-rapamycin, and 40-O-tetrazole-rapamycin, ABT-578, clobetasol, prodrugs thereof, co-drugs thereof, and combinations thereof. The implantable device can be implanted in a patient to treat or prevent a disorder such as atherosclerosis, thrombosis, restenosis, hemorrhage, vascular dissection or perforation, vascular aneurysm, vulnerable plaque, chronic total occlusion, claudication, anastomotic proliferation for vein and artificial grafts, bile duct obstruction, ureter obstruction, tumor obstruction, or combinations thereof. Provided herein is a polymer containing siloxane monomers and monomers that provide strength to the polymer. The siloxane monomers can provide flexibility for the polymer. The strength monomers impart strength to the polymer. The polymer can be a random polymer. Alternatively, the polymer can be a block copolymer having a general formula of AB, ABA, or BAB, or a graft copolymer such as A-g-B or B-g-A, A being the polysiloxane block and B being the block formed of the strength monomers. The polymer is useful for coating an implantable device such as a stent. A medical device, such as a stent, can also be made from this polymer. Linking groups X can be any linking agent commonly used in the art. Some of the representative linking agents linking agents include, for example, agents bearing hydroxyl, epoxide, carboxyl, amino, imide, aziridine, thiol, phosphoryl, aldehyde, anhydride, acyl halide, silyl, isocyanate, diisocyanate, carbodiimide, a dihydrazide, a multiaziridine, a multifunctional carbodiimide, isothiocynate or a diamine functionalities, a polymer bearing a primary amine side group or side groups, N-hydroxy-succinamide, acryloxy terminated polyethylene glycol, and methacryloxy terminated polyethylene glycol. Other linking agents are listed in commercial catalogues such as Shearwater catalogue (Shearwater Polymers, Inc., Huntsville, Ala.) and Piercenet (http://www.piercenet.com/Object/View.cfm?type=File&ID=6ED00DF7-DE88-41C4-936A-2ED95613340A) (Pierce Biotechnology, Inc., Rockford, Ill.). The strength monomers can be any biocompatible monomers capable of imparting strength to the polymer. Some representative monomers include fluorinated monomers such as ethylene, propylene, vinylidene fluoride, hexafluoropropene, tetrafluoroethylene, chlorotrifluoroethylene, vinyl fluoride, and hydropentafluoropropene, high Tg (e.g., Tg above ambient temperature) methacrylates such as methyl methacrylate, ethyl methacrylate, n-propyl methacrylate, and t-butyl methacrylate, styrene, methyl styrene, hydroxyl ethyl acrylate, 4-methoxyphenyl acrylate, t-butyl acrylate, o-tolyl acrylate, hydroxyl ethyl methacrylate, isotactic cyclohexyl methacrylate, cyclohexyl methacrylate, cyclohexyl acrylate, isopropyl methacrylate, 3,3-dimethylbutyl methacrylate, ethyl fluoromethacrylate and combinations thereof. The polymer described herein can be synthesized by methods known in the art (see, for example, D. Braun, et al., Polymer Synthesis: Theory and Practice. Fundamentals, Methods, Experiments. 3rd Ed., Springer, 2001; Hans R. Kricheldorf, Handbook of Polymer Synthesis, Marcel Dekker Inc., 1992). For example, one method that can be used to make the polymer can be free radical methods (see, for example, D. Braun, et al., Polymer Synthesis: Theory and Practice. Fundamentals, Methods, Experiments. 3rd Ed., Springer, 2001; Hans R. Kricheldorf, Handbook of Polymer Synthesis, Marcel Dekker Inc., 1992). Polymerization in solvent can also be used to synthesize the polymer described herein. Copolymerization prevents phase separation on a large scale. For systems where the reactivity ratios of the monomers greatly differ, a random polymerization will result in less and less of a random structure. Polymerizations that proceed step-wise via the formation of prepolymers may be used to achieve block structures (See, for example, J. Kopecek, et al., Prog. Polym. Sci, 9:34 (1983)). For example, in one embodiment, the polymer described herein can be formed by quasi-random copolymerization by reacting a chlorinated monomer of the hard segment such as a dichlorofluoroalkane with hydroxylated silane such as dimethyl silanol. 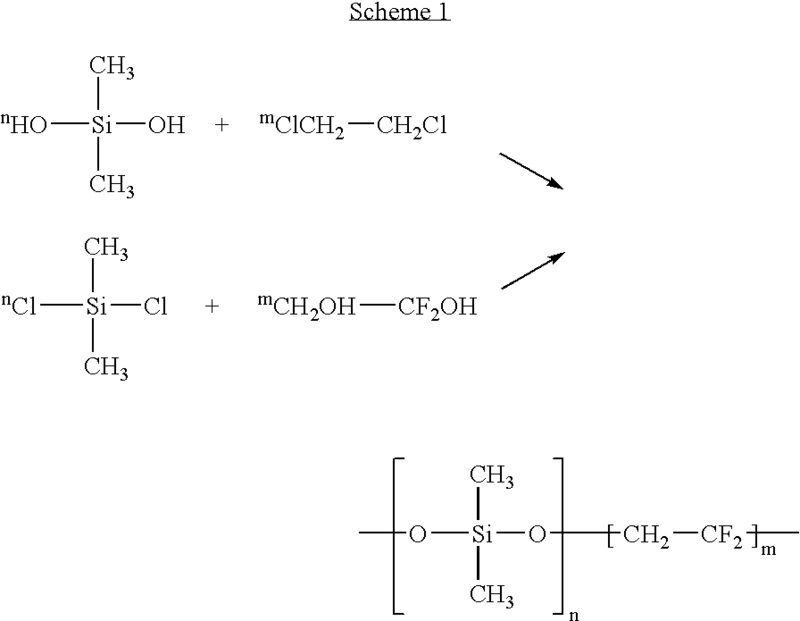 Alternatively, a dichlorosilane can react with a diol to form a polymer having siloxane monomers (Scheme 1). Polymers containing siloxane monomers with other strength monomers can be synthesized via reaction of a dialkylsilanol with a diol or via reaction of a dialkylsilanol with a diol in the presence of a tin catalyst. 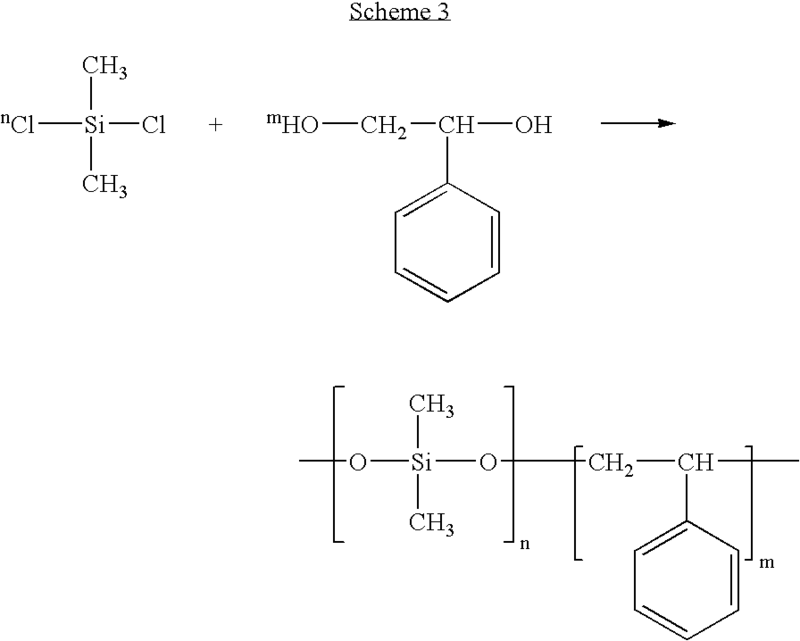 For example, poly(dimethyl siloxane-co-alkyl methacrylate) can be readily synthesized by these two routes (Scheme 2) and poly(dimethylsiloxane-co-styrene) can be synthesized by the reaction of dimethyldichlorosilane with phenyl ethylene glycol (Scheme 3). Block copolymers containing a siloxane block and one or more blocks of strength monomers can be prepared via atom-transfer radical polymerization (ATRP) (see, e.g., Honigfort, M. E.; et al., Polym. Prepr. 43:561 (2002)) or initiator-transfer agent-terminator (INIFERTER) polymerization (Qin, et al., J. Appl. Poly. Sci. 80(13):2566-72 (2001)). The ATRP or INIFERTER polymerization can produce a block of strength monomers with terminal functionality, which can be allowed to couple with one or two blocks of polysiloxane to generate a block copolymer containing one or more blocks of polysiloxane which imparts flexibility to the polymer and one or more blocks of strength monomers as hard segment(s) to impart mechanical strength to the polymer. In one embodiment, the polysiloxane block is polydimethylsiloxane. The hard segment can be, for example, a polystyrene block, a poly(methacrylate) block, or a poly(vinylidene fluoride) (PVDF) block. Both polystyrene and poly(methacrylate) are non-crystalline components with high Tg. PVDF has a low Tg but is a crystalline polymer. By varying the ratio of a siloxane to monomers of the hard segment, one can generate thermoplastic polymer elastomer with tunable properties. The block copolymer can also be prepared for example through free radical polymerization via macroazoinitiator (Hamurcu et al J. Appl. Polym Sci. 62: 1415-1426 (1996)). In this route, α, ω-amine terminated organofunctional polydimethylsiloxane (PDMS) can be condensed with, for example, 4,4′-azobis-4-cyanopentanoyl chloride (ACPC) to prepare macroazoinitiator containing siloxane units. Block copolymer or graft polymer containing PDMS and strength monomers were then derived by the polymerization of strength monomer initiated by macroazoinitiators. Attaching a bioactive molecule to the molecule of formula I is well documented. In another embodiment, the polymer of formulae I-VI can be blended with another biocompatible polymer to form a coating material for an implantable device or to form the implantable device itself. The biocompatible polymer can be biodegradable (bioerodable/bioabsorbable) or nondegradable. Representative examples of these biocompatible polymers include, but are not limited to, poly(ester amide), polyhydroxyalkanoates (PHA), poly(3-hydroxyalkanoates) such as poly(3-hydroxypropanoate), poly(3-hydroxybutyrate), poly(3-hydroxyvalerate), poly(3-hydroxyhexanoate), poly(3-hydroxyheptanoate) and poly(3-hydroxyoctanoate), poly(4-hydroxyalknaote) such as poly(4-hydroxybutyrate), poly(4-hydroxyvalerate), poly(4-hydroxyhexanote), poly(4-hydroxyheptanoate), poly(4-hydroxyoctanoate) and copolymers including any of the 3-hydroxyalkanoate or 4-hydroxyalkanoate monomers described herein or blends thereof, polyesters, poly(D,L-lactide), poly(L-lactide), polyglycolide, poly(D,L-lactide-co-glycolide), poly(L-lactide-co-glycolide), polycaprolactone, poly(lactide-co-caprolactone), poly(glycolide-co-caprolactone), poly(dioxanone), poly(ortho esters), poly(anhydrides), poly(tyrosine carbonates) and derivatives thereof, poly(tyrosine ester) and derivatives thereof, poly(imino carbonates), poly(glycolic acid-co-trimethylene carbonate), polyphosphoester, polyphosphoester urethane, poly(amino acids), polycyanoacrylates, poly(trimethylene carbonate), poly(iminocarbonate), polyurethanes, polyphosphazenes, silicones, polyesters, polyolefins, polyisobutylene and ethylene-alphaolefin copolymers, acrylic polymers and copolymers, vinyl halide polymers and copolymers, such as polyvinyl chloride, polyvinyl ethers, such as polyvinyl methyl ether, polyvinylidene halides, such as and polyvinylidene chloride, polyacrylonitrile, polyvinyl ketones, polyvinyl aromatics, such as polystyrene, polyvinyl esters, such as polyvinyl acetate, copolymers of vinyl monomers with each other and olefins, such as ethylene-methyl methacrylate copolymers, acrylonitrile-styrene copolymers, ABS resins, and ethylene-vinyl acetate copolymers, polyamides, such as Nylon 66 and polycaprolactam, alkyd resins, polycarbonates, polyoxymethylenes, polyimides, polyethers, poly(glyceryl sebacate), poly(propylene fumarate), epoxy resins, polyurethanes, rayon, rayon-triacetate, cellulose acetate, cellulose butyrate, cellulose acetate butyrate, cellophane, cellulose nitrate, cellulose propionate, cellulose ethers, carboxymethyl cellulose, polyethers such as poly(ethylene glycol) (PEG), copoly(ether-esters) (e.g. PEO/PLA); polyalkylene oxides such as poly(ethylene oxide), poly(propylene oxide), poly(ether ester), polyalkylene oxalates, polyphosphazenes, phosphoryl choline, choline, poly(aspirin), polymers and co-polymers of hydroxyl bearing monomers such as hydroxyethyl methacrylate (HEMA), hydroxypropyl methacrylate (HPMA), hydroxypropylmethacrylamide, PEG acrylate (PEGA), PEG methacrylate, 2-methacryloyloxyethylphosphorylcholine (MPC) and n-vinyl pyrrolidone (VP), carboxylic acid bearing monomers such as methacrylic acid (MA), acrylic acid (AA), alkoxymethacrylate, alkoxyacrylate, and 3-trimethylsilylpropyl methacrylate (TMSPMA), poly(styrene-isoprene-styrene)-PEG (SIS-PEG), polystyrene-PEG, polyisobutylene-PEG, polycaprolactone-PEG (PCL-PEG), PLA-PEG, poly(methyl methacrylate)-PEG (PMMA-PEG), polydimethylsiloxane-co-PEG (PDMS-PEG), poly(vinylidene fluoride)-PEG (PVDF-PEG), PLURONIC™ surfactants (polypropylene oxide-co-polyethylene glycol), poly(tetramethylene glycol), hydroxy functional poly(vinyl pyrrolidone), biomolecules such as collagen, chitosan, alginate, fibrin, fibrinogen, cellulose, starch, collagen, dextran, dextrin, fragments and derivatives of hyaluronic acid, heparin, fragments and derivatives of heparin, glycosamino glycan (GAG), GAG derivatives, polysaccharide, elastin, chitosan, alginate, and combinations thereof. In some embodiments, the polymer can exclude any one of the aforementioned polymers. As used herein, the terms poly(D,L-lactide) (PDLL), poly(L-lactide) (PLL), poly(D,L-lactide-co-glycolide) (PDLLG), and poly(L-lactide-co-glycolide) (PLLG) are used interchangeably with the terms poly(D,L-lactic acid) (PDLLA), poly(L-lactic acid) (PLLA), poly(D,L-lactic acid-co-glycolic acid) (PDLLAGA), and poly(L-lactic acid-co-glycolic acid) (PLLAGA), respectively. The polymers described herein can form a coating on an implantable device optionally with one or more bioactive agents. The agents can be blended, mixed, bonded, or conjugated to the polymers of the invention. Examples of such agents include synthetic inorganic and organic compounds, proteins and peptides, polysaccharides and other sugars, lipids, and DNA and RNA nucleic acid sequences having therapeutic, prophylactic or diagnostic activities. Nucleic acid sequences include genes, antisense molecules which bind to complementary DNA to inhibit transcription, and ribozymes. Other examples of drugs include antibodies, receptor ligands, and enzymes, adhesion peptides, oligosaccharides, blood clotting factors, inhibitors or clot dissolving agents such as streptokinase and tissue plasminogen activator, antigens for immunization, hormones and growth factors, oligonucleotides such as antisense oligonucleotides and ribozymes and retroviral vectors for use in gene therapy. Such agents can also include a prohealing drug that imparts a benign neointimal response characterized by controlled proliferation of smooth muscle cells and controlled deposition of extracellular matrix with complete luminal coverage by phenotypically functional (similar to uninjured, healthy intima) and morphologically normal (similar to uninjured, healthy intima) endothelial cells. Such agents can also fall under the genus of antineoplastic, cytostatic, anti-inflammatory, antiplatelet, anticoagulant, antifibrin, antithrombin, antimitotic, antibiotic, antiallergic and antioxidant substances. Examples of such antineoplastics and/or antimitotics include paclitaxel (e.g. TAXOL® by Bristol-Myers Squibb Co., Stamford, Conn.), docetaxel (e.g. Taxotere®, from Aventis S.A., Frankfurt, Germany) methotrexate, azathioprine, vincristine, vinblastine, fluorouracil, doxorubicin hydrochloride (e.g. Adriamycin® from Pharmacia & Upjohn, Peapack N.J.), and mitomycin (e.g. Mutamycin® from Bristol-Myers Squibb Co., Stamford, Conn.). Examples of such antiplatelets, anticoagulants, antifibrin, and antithrombins include heparinoids, hirudin, recombinant hirudin, argatroban, forskolin, vapiprost, prostacyclin and prostacyclin analogues, dextran, D-phe-pro-arg-chloromethylketone (synthetic antithrombin), dipyridamole, glycoprotein IIb/IIIa platelet membrane receptor antagonist, antibody, and thrombin inhibitors such as Angiomax ä (Biogen, Inc., Cambridge, Mass.). Examples of cytostatic agents include angiopeptin, angiotensin converting enzyme inhibitors such as captopril (e.g. Capoten® and Capozide® from Bristol-Myers Squibb Co., Stamford, Conn.), cilazapril or lisinopril (e.g. Prinivil® and Prinzide® from Merck & Co., Inc., Whitehouse Station, N.J.), actinomycin D, or derivatives and analogs thereof (manufactured by Sigma-Aldrich 1001 West Saint Paul Avenue, Milwaukee, Wis. 53233; or COSMEGEN available from Merck). Synonyms of actinomycin D include dactinomycin, actinomycin IV, actinomycin I1, actinomycin X1, and actinomycin C1. Other drugs include calcium channel blockers (such as nifedipine), colchicine, fibroblast growth factor (FGF) antagonists, fish oil (omega 3-fatty acid), histamine antagonists, lovastatin (an inhibitor of HMG-CoA reductase, a cholesterol lowering drug, brand name Mevacor® from Merck & Co., Inc., Whitehouse Station, N.J.), monoclonal antibodies (such as those specific for Platelet-Derived Growth Factor (PDGF) receptors), nitroprusside, phosphodiesterase inhibitors, prostaglandin inhibitors, suramin, serotonin blockers, steroids, thioprotease inhibitors, triazolopyrimidine (a PDGF antagonist), and nitric oxide. An example of an antiallergic agent is permirolast potassium. Other therapeutic substances or agents which may be appropriate include alpha-interferon, genetically engineered epithelial cells, antibodies such as CD-34 antibody, abciximab (REOPRO), and progenitor cell capturing antibody, prohealing drugs that promotes controlled proliferation of muscle cells with a normal and physiologically benign composition and synthesis products, enzymes, anti-inflammatory agents, antivirals, anticancer drugs, anticoagulant agents, free radical scavengers, steroidal anti-inflammatory agents, non-steroidal anti-inflammatory agents, antibiotics, nitric oxide donors, super oxide dismutases, super oxide dismutases mimics, 4-amino-2,2,6,6-tetramethylpiperidine-1-oxyl (4-amino-TEMPO), dexamethasone, clobetasol, aspirin, estradiol, tacrolimus, rapamycin, rapamycin derivatives, 40-O-(2-hydroxy)ethyl-rapamycin (everolimus), 40-O-(3-hydroxy)propyl-rapamycin, 40-O-[2-(2-hydroxy)ethoxy]ethyl-rapamycin, 40-O-tetrazole-rapamycin, ABT-578, progenitor cell capturing antibody, pro-drugs thereof, co-drugs thereof, and a combination thereof. The foregoing substances are listed by way of example and are not meant to be limiting. Other active agents which are currently available or that may be developed in the future are equally applicable. The dosage or concentration of the bioactive agent required to inhibit or promote a favorable therapeutic effect should be less than the level at which the bioactive agent produces toxic effects and greater than the level at which non-therapeutic results are obtained. The dosage or concentration of the bioactive agent can depend upon factors such as the particular circumstances of the patient; the nature of the trauma; the nature of the therapy desired; the time over which the ingredient administered resides at the vascular site; and if other active agents are employed, the nature and type of the substance or combination of substances. Therapeutic effective dosages can be determined empirically, for example by infusing vessels from suitable animal model systems and using immunohistochemical, fluorescent or electron microscopy methods to detect the agent and its effects, or by conducting suitable in vitro studies. The bioactive compound can be incorporated into polymeric coating in a percent loading of between 0.01% and 70% by weight, more preferably between 5% and 50% by weight. Standard pharmacological test procedures to determine dosages are understood by one of ordinary skill in the art. The polymer described herein can be used to coat an implantable device, one example of which is a stent, or forming an implantable device with a biobeneficial material. The biobeneficial can be blended, mixed, bonded, or conjugated to the polymers of the invention. The biobeneficial material can be a polymeric material or non-polymeric material. The biobeneficial material is preferably flexible when present as a discrete layer, or confers elastic properties in a blend or copolymer, and is biocompatible and/or biodegradable, more preferably non-toxic, non-antigenic and non-immunogenic. Representative biobeneficial materials include, but are not limited to, polyethers such as poly(ethylene glycol), copoly(ether-esters) (e.g. PEO/PLA); polyalkylene oxides such as poly(ethylene oxide), poly(propylene oxide), poly(ether ester), polyalkylene oxalates, polyphosphazenes, phosphoryl choline, choline, poly(aspirin), polymers and co-polymers of hydroxyl bearing monomers such as hydroxyethyl methacrylate (HEMA), hydroxypropyl methacrylate (HPMA), hydroxypropyl methacrylamide, PEG acrylate (PEGA), PEG methacrylate, 2-methacryloyloxyethylphosphorylcholine (MPC) and n-vinyl pyrrolidone (VP), carboxylic acid bearing monomers such as methacrylic acid (MA), acrylic acid (AA), alkoxymethacrylate, alkoxyacrylate, and 3-trimethylsilylpropyl methacrylate (TMSPMA), polystyrene-polyisoprene-polystyrene-co-PEG (SIS-PEG), polystyrene-PEG, polyisobutylene-PEG, polycaprolactone-PEG (PCL-PEG), PLA-PEG, poly(methyl methacrylate)-PEG (PMMA-PEG), polydimethylsiloxane-co-PEG (PDMS-PEG), poly(vinylidene fluoride)-PEG (PVDF-PEG), PLURONIC™ surfactants (polypropylene oxide-co-polyethylene glycol), poly(tetramethylene glycol), hydroxy functional poly(vinyl pyrrolidone), biomolecules such as fibrin, fibrinogen, cellulose, starch, collagen, dextran, dextrin, hyaluronic acid, fragments and derivatives of hyaluronic acid, heparin, fragments and derivatives of heparin, glycosamino glycan (GAG), GAG derivatives, polysaccharide, elastin, chitosan, alginate, silicones, and combinations thereof. In some embodiments, the polymer can exclude any one of the aforementioned polymers. In a preferred embodiment, the biobeneficial material is a block copolymer comprising flexible poly(ethylene glycol terephthalate)/poly(butylenes terephthalate) (PEGT/PBT) segments (PolyActive™). These segments are biocompatible, non-toxic, non-antigenic and non-immunogenic. Previous studies have shown that the PolyActive™ top coat decreases the thrombosis and embolism formation on stents. PolyActive™ is generally expressed in the form of xPEGTyPBTz, in which x is the molecular weight of PEG, y is percentage of PEGT, and z is the percentage of PBT. A specific PolyActive™ polymer can have various ratios of the PEG, ranging from about 1% to about 99%, e.g., about 10% to about 90%, about 20% to about 80%, about 30% to about 70%, about 40% to about 60% PEG. The PEG for forming PolyActive™ can have a molecular weight ranging from about 300 Daltons to about 100,000 Daltons, e.g., about 300 Daltons, about 500 Daltons, about 1,000 Daltons, about 5,000 Daltons, about 10,000 Daltons, about 20,000 Daltons, or about 50,000 Daltons. In another preferred embodiment, the biobeneficial material can be a polyether such as polyehthylene glycol (PEG) or polyalkylene oxide. As used herein, an implantable device may be any suitable medical substrate that can be implanted in a human or veterinary patient. Examples of such implantable devices include self-expandable stents, balloon-expandable stents, stent-grafts, grafts (e.g., aortic grafts), artificial heart valves, cerebrospinal fluid shunts, pacemaker electrodes, and endocardial leads (e.g., FINELINE and ENDOTAK, available from Guidant Corporation, Santa Clara, Calif.). The underlying structure of the device can be of virtually any design. The device can be made of a metallic material or an alloy such as, but not limited to, cobalt chromium alloy (ELGILOY), stainless steel (316L), high nitrogen stainless steel, e.g., BIODUR 108, cobalt chrome alloy L-605, “MP35N,” “MP20N,” ELASTINITE (Nitinol), tantalum, nickel-titanium alloy, platinum-iridium alloy, gold, magnesium, or combinations thereof. “MP35N” and “MP20N” are trade names for alloys of cobalt, nickel, chromium and molybdenum available from Standard Press Steel Co., Jenkintown, Pa. “MP35N” consists of 35% cobalt, 35% nickel, 20% chromium, and 10% molybdenum. “MP20N” consists of 50% cobalt, 20% nickel, 20% chromium, and 10% molybdenum. Devices made from bioabsorbable or biostable polymers could also be used with the embodiments of the present invention. In accordance with embodiments of the invention, a coating of the various described embodiments can be formed on an implantable device or prosthesis, e.g., a stent. In some embodiments, the body of the stent itself can be made from materials including the embodiments of the invention. For coatings including one or more active agents, the agent will retain on the medical device such as a stent during delivery and expansion of the device, and released at a desired rate and for a predetermined duration of time at the site of implantation. Preferably, the medical device is a stent. A stent having the above-described coating is useful for a variety of medical procedures, including, by way of example, treatment of obstructions caused by tumors in bile ducts, esophagus, trachea/bronchi and other biological passageways. A stent having the above-described coating is particularly useful for treating occluded regions of blood vessels caused by abnormal or inappropriate migration and proliferation of smooth muscle cells, thrombosis, and restenosis. Stents may be placed in a wide array of blood vessels, both arteries and veins. Representative examples of sites include the iliac, renal, and coronary arteries. For implantation of a stent, an angiogram is first performed to determine the appropriate positioning for stent therapy. An angiogram is typically accomplished by injecting a radiopaque contrasting agent through a catheter inserted into an artery or vein as an x-ray is taken. A guidewire is then advanced through the lesion or proposed site of treatment. Over the guidewire is passed a delivery catheter which allows a stent in its collapsed configuration to be inserted into the passageway. The delivery catheter is inserted either percutaneously or by surgery into the femoral artery, brachial artery, femoral vein, or brachial vein, and advanced into the appropriate blood vessel by steering the catheter through the vascular system under fluoroscopic guidance. A stent having the above-described coating may then be expanded at the desired area of treatment. A post-insertion angiogram may also be utilized to confirm appropriate positioning. The embodiments of the present invention will be illustrated by the following set forth prophetic examples. All parameters and data are not to be construed to unduly limit the scope of the embodiments of the invention. Polystyrene-b-polydimethylsiloxane (PS-b-PDMS) is purchased from Polymer Source Inc. Montreal Canada (www.polymersource.com) (Product Cat No. : P2617-SDMS, and PS/PDMS=36/14.8). 2% of PS-b-PDMS and 0.5% everolimus solution in chloroform-xylene (80:20) mixture can be prepared by adding 2 g of PS-b-PDMS and 0.5 g of everolimus into 78 gram of chloroform and 19.5 g of xylene mixture. The solution is shaken at room temperature until the drug and polymer fully dissolved. Alternatively, the suspension can be put in the oven at 50° C. for 1-2 hrs to speed up the polymer and drug dissolution. The coating process can be briefly described as follows. A Vision 3×18 mm stent is pre-weighed, secured in the coating mandrel and mounted on a spray-coater. The polymer-drug solution is spray-coated on the stents with a flow rate of 20 μg per pass. The coating is dried in between from a dry air nozzle. After the coating weight is built about 500 μg, the coating is done. The stent is then dried in the oven at preset temperature, e.g. 50° C. The drug release rate can be measured in 2% porcine serum albumin. Polymethyl methacrylate-b-polydimethylsiloxane (PMMA-b-PDMS) is purchased from Polymer Source Inc. Montreal Canada (Product Cat. No. : P2493-DMSMMA, and PMMA/PDMS=20/8). 2% of PMMA-b-PDMS and 1% everolimus solution in chloroform-xylene (80:20) mixture is prepared by adding 2 g of PMMA-b-PDMS and 1 g of everolimus into 77.6 g of chloroform and 19.4 gram of xylene mixture. The solution is shaken at room temperature until the drug and polymer fully dissolved. Alternatively, the suspension can be put in the oven at 50° C. for 1-2 hrs to speed up the polymer and drug dissolution. The solution can be coated onto a stent as described in Example 1. Poly(t-butyl acrylate-b-dimethylsiloxane) (PtBuA-b-PDMS) is purchased from Polymer Source Inc. Montreal Canada (Product Cat. No. : P2591-DMStBuA, and PtBuA/PDMS=18/8). 2% PtBuA-b-PDMS and 0.75% everolimus solution in chloroform-xylene (80:20) mixture is prepared by adding 2 g of PMMA-b-PDMS and 1 g of everolimus into 77.6 g of chloroform and 19.4 g of xylene mixture. The solution is shaken at room temperature until the drug and polymer fully dissolved. Alternatively, the suspension can be put in the oven at 50° C. for 1-2 hrs to speed up the polymer and drug dissolution. where R1 and R2 are independently H, F, Cl, Br, I, C1-C10 alkyl, C3-C10 cycloalkyl, substituted C1-C10 alkyl, haloalkyl, fluoroalkyl, chloroalkyl, bromoalkyl, iodoalkyl, phenyl, substituted phenyl, alkoxyphenyl, halophenyl and alkylphenyl, aryl, or substituted aryl, alkoxyaryl, haloaryl and alkylaryl, and Z1 and Z2 are independently absence or oxygen (O). 2. The biocompatible polymer of claim 1, wherein the biobeneficial moiety is poly(ethylene glycol). 3. The biocompatible polymer of claim 1, wherein R1 and R2 are independently fluoroalkyl groups. 4. The biocompatible polymer of claim 1 wherein the strength monomer is selected from the group consisting of ethylene, propylene, vinylidene fluoride, hexafluoropropene, tetrafluoroethylene, chlorotrifluoroethylene, vinyl fluoride, and hydropentafluoropropene, high Tg methacrylates, methyl methacrylate, ethyl methacrylate, n-propyl methacrylate, t-butyl methacrylate, styrene, methyl styrene, hydroxyl ethyl acrylate, 4-methoxyphenyl acrylate, t-butyl acrylate, o-tolyl acrylate, hydroxyl ethyl methacrylate, isotactic cyclohexyl methacrylate, cyclohexyl methacrylate, cyclohexyl acrylate, isopropyl methacrylate, 3,3-dimethylbutyl methacrylate, ethyl fluoromethacrylate and combinations thereof. 5. An implantable device having a biocompatible coating thereon, wherein the biocompatible coating comprises the biocompatible polymer of claim 1. 6. An implantable device having a biocompatible coating thereon, wherein the biocompatible coating comprises the biocompatible polymer of claim 2. 7. An implantable device having a biocompatible coating thereon, wherein the biocompatible coating comprises the biocompatible polymer of claim 3. 8. An implantable device having a biocompatible coating thereon, wherein the biocompatible coating comprises the biocompatible polymer of claim 4. 9. The implantable device of claim 5 which is a drug-delivery stent, wherein the coating further comprises a bioactive agent. 10. The implantable device of claim 6 which is a drug-delivery stent, wherein the coating further comprises a bioactive agent. 11. The implantable device of claim 7 which is a drug-delivery stent, wherein the coating further comprises a bioactive agent. 12. The implantable device of claim 8 which is a drug-delivery stent, wherein the coating further comprises a bioactive agent. 13. The drug-delivery stent of claim 9, wherein the bioactive agent is selected from the group consisting of paclitaxel, docetaxel, estradiol, nitric oxide donors, super oxide dismutases, super oxide dismutases mimics, 4-amino-2,2,6,6-tetramethylpiperidine-1-oxyl (4-amino-TEMPO), tacrolimus, dexamethasone, rapamycin, rapamycin derivatives, 40-O-(2-hydroxy)ethyl-rapamycin (everolimus), 40-O-(3-hydroxy)propyl-rapamycin, 40-O-[2-(2-hydroxy)ethoxy]ethyl-rapamycin, and 40-O-tetrazole-rapamycin, ABT-578, clobetasol, progenitor cell capturing antibody, prohealing drugs, prodrugs thereof, co-drugs thereof, and a combination thereof. 14. The drug-delivery stent of claim 10, wherein the bioactive agent is selected from the group consisting of paclitaxel, docetaxel, estradiol, nitric oxide donors, super oxide dismutases, super oxide dismutases mimics, 4-amino-2,2,6,6-tetramethylpiperidine-1-oxyl (4-amino-TEMPO), tacrolimus, dexamethasone, rapamycin, rapamycin derivatives, 40-O-(2-hydroxy)ethyl-rapamycin (everolimus), 40-O-(3-hydroxy)propyl-rapamycin, 40-O-[2-(2-hydroxy)ethoxy]ethyl-rapamycin, and 40-O-tetrazole-rapamycin, ABT-578, clobetasol, progenitor cell capturing antibody, prohealing drugs, prodrugs thereof, co-drugs thereof, and a combination thereof. 15. The drug-delivery stent of claim 11, wherein the bioactive agent is selected from the group consisting of paclitaxel, docetaxel, estradiol, nitric oxide donors, super oxide dismutases, super oxide dismutases mimics, 4-amino-2,2,6,6-tetramethylpiperidine-1-oxyl (4-amino-TEMPO), tacrolimus, dexamethasone, rapamycin, rapamycin derivatives, 40-O-(2-hydroxy)ethyl-rapamycin (everolimus), 40-O-(3-hydroxy)propyl-rapamycin, 40-O-[2-(2-hydroxy)ethoxy]ethyl-rapamycin, and 40-O-tetrazole-rapamycin, ABT-578, clobetasol, progenitor cell capturing antibody, prohealing drugs, prodrugs thereof, co-drugs thereof, and a combination thereof. 16. The drug-delivery stent of claim 12, wherein the bioactive agent is selected from the group consisting of paclitaxel, docetaxel, estradiol, nitric oxide donors, super oxide dismutases, super oxide dismutases mimics, 4-amino-2,2,6,6-tetramethylpiperidine-1-oxyl (4-amino-TEMPO), tacrolimus, dexamethasone, rapamycin, rapamycin derivatives, 40-O-(2-hydroxy)ethyl-rapamycin (everolimus), 40-O-(3-hydroxy)propyl-rapamycin, 40-O-[2-(2-hydroxy)ethoxy]ethyl-rapamycin, and 40-O-tetrazole-rapamycin, ABT-578, clobetasol, progenitor cell capturing antibody, prohealing drugs, prodrugs thereof, co-drugs thereof, and a combination thereof.